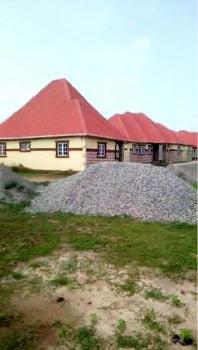 There are 30 available flats, houses, land and commercial property in Ewekoro, Ogun, Nigeria. The property have been listed by estate agents who can be contacted using the contact information provided for each property listing. The list can be filtered by price, furnishing and recency. This is a fast developing area in Ayepe Village, close to Ifo General Hospital, Ewekoro Local Govt Ogun State. 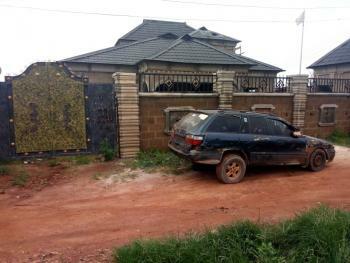 Few residents already on the street where this estate is situated. It is about 10 minutes to get to the land after Ifo off the Lagos Abeokuta Expressway. 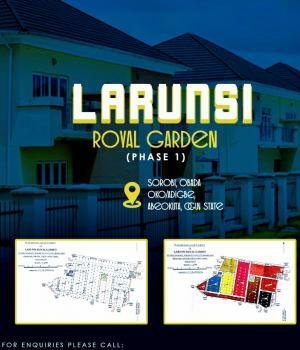 Features: Free from Govt acquisition, Gated estate, road layout established, Power Supply. Work Ongoing at Site. Deed of Assignment. Terms & Conditions apply. 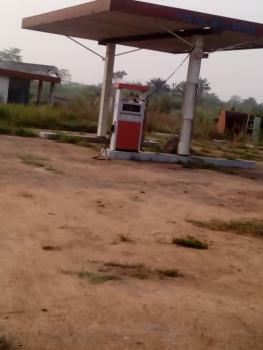 Functional filling station with 6 pumps and lubrication bay on 2 plots of land at Papa, Ogun state for sale. 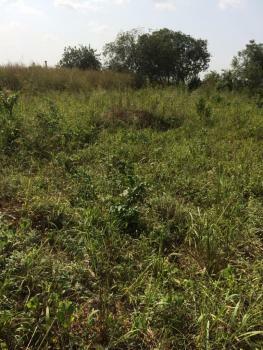 Price : N50,000,000 ........................ Another 1 acre of land right behind the filling station for sale at N2,500,000. Call for further details. 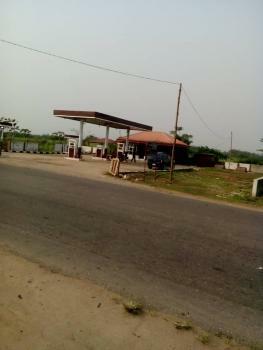 Non functional filling station with 6 pumps and lubrication bay on 2 plots of land at Itori, Ogun state for LEASE. The station needs renovation and maintenance. Call for details. 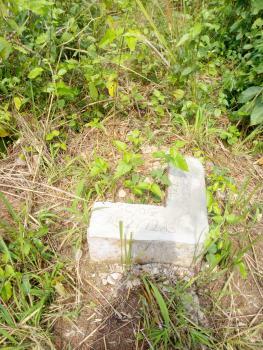 3 hectares of land for sale at ewekoro LGA,ogun state,with survey Red copy. An off plan 4 bedroom fully detached duplex sitting on 350sqm land with massive sitting room, big master’s bedroom, dining, guest toilet, ample car park, borehole etc. 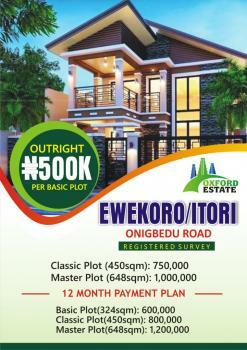 is for sale within an estate at Ewekoro, Ogun state. 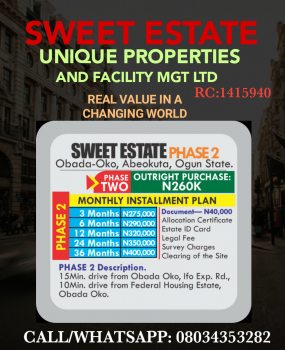 Price: N20m Title: Receipt and Deed of Assignment Brokerage: 5% (slightly negotiable) of purchase price to be paid by the buyer as commission/brokerage. CRYSTAL PARK & GARDENS IFO-EWEKORO is an housing scheme situated at ifo ewekoro, along abeokuta express road, 5 minutes drive from larfarge cement and numerous multinational companies and community residents, its a serene environment with many social amenities like good road, electricity supply, good water and many more. Why then waiting when others are asking for more. Crystal park and gardens is situated at okolemo pipeline papalantoro, adjacent lafarge cement, under ewekoro local government area of Ogun State, neighbours to numerous companies, several estates, institutions and lots more. Hurry now while stock last. 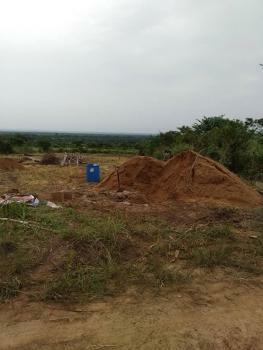 Large expanse of land at obada Oko within ewekoro local govt area is ongoing for cheap price. 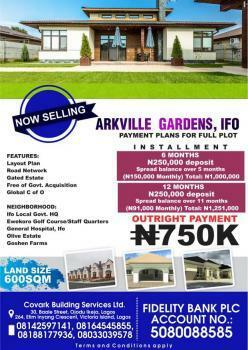 Grab your acres and plot now from us today. 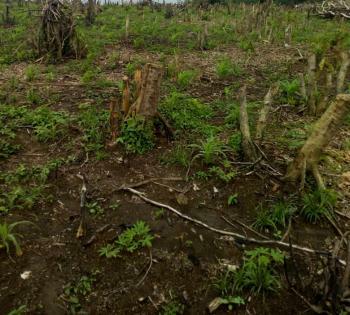 Cheap Land And Plantain Farm Forsale At Ewekoro Lga, Ogun State, Nigeria. Be a landlord today @ Richlife Estate & Gardens Special Land Promo.Site: Beside Lafarge Staff Estate, Lapeleke Town.Size: full plot (600sqm)/half plot (300sqm)Benefits -No Omo-onile Wahala -Flexible payment plan (installments i.e. key-in with as low as #20,000) -Gated community & adequate Security -Free from Govt. acquisition & Litigation.Act fast now! Buy for future investment! ₦600,000 Richlife Commercial & Logistics Ltd. Completed 8 units brand new 3 bedroom bungalows with 45 units layout plan on a total land of 22,000square meters/36plots/6Acres of land at Lakeview Royal Garden Estate Abule odo alafia,wasimi,itori,Ewekoro,Ogun state. #120m asking for the whole estate. Ewekoro is a Local Government Area (LGA) in Ogun state, Nigeria with its headquarters at Itori.Â Ewekoro first came into existence on 22nd of May, 1981 through the grace of the then Governor of Ogun State, Chief Bisi Onabanjo (Late). In 1984 when the military took over, it was merged with Ifo Local Government in 1989.Â However, on December 16, 1996 Ewekoro Local Government was restored as an autonomous Local Government by the then Federal Military Government alongside five other in the sate, thus increasing the number of Local Government in Ogun State from fifteen to twenty.